Thousands are expected to visit the Fog Fest on September 29th and 30th. To help plan your visit, here are some tips to make your trip to the coast a more fun and enjoyable one. View and download a copy of the 2018 Festival Map. Routes 110 and 112 will get you to Fog Fest. NOTE: Some normal routes may be rerouted to Oceana or Francisco Blvd. instead of the normal Beach Blvd. route. From Oceana Blvd. you can walk the highway’s pedestrian crossover for easy access to the festival grounds. Free bicycle parking will be available at the south end of Palmetto Ave in front of the old utility building on the west side of the street, look for the sign. Pacifica is 15 miles south of San Francisco. The best way to get to Pacifica from SF is to take Highway 280 to Highway 1/Pacifica and exit either at Palmetto/Manor Dr. or continue to the next exit at Francisco Blvd/Paloma Ave.
From the East Bay, travel west on Highway 92 over the San Mateo Bridge. Continue west on Highway 92 to Interstate 280. Take Interstate 280 north to Skyline/35/Pacifica exit, Left/west on Sharp Park Rd. that will lead into Francisco Blvd. Festival grounds are 1 block west of Francisco Blvd and north of Sharp Park Golf Course. From the South Bay, take Interstate 280 North to Skyline/35/Pacifica exit, left/west on Sharp Park Rd. that will lead into Francisco Blvd., Festival grounds are 1 block west of Francisco Blvd and north of the Sharp Park Golf Course. 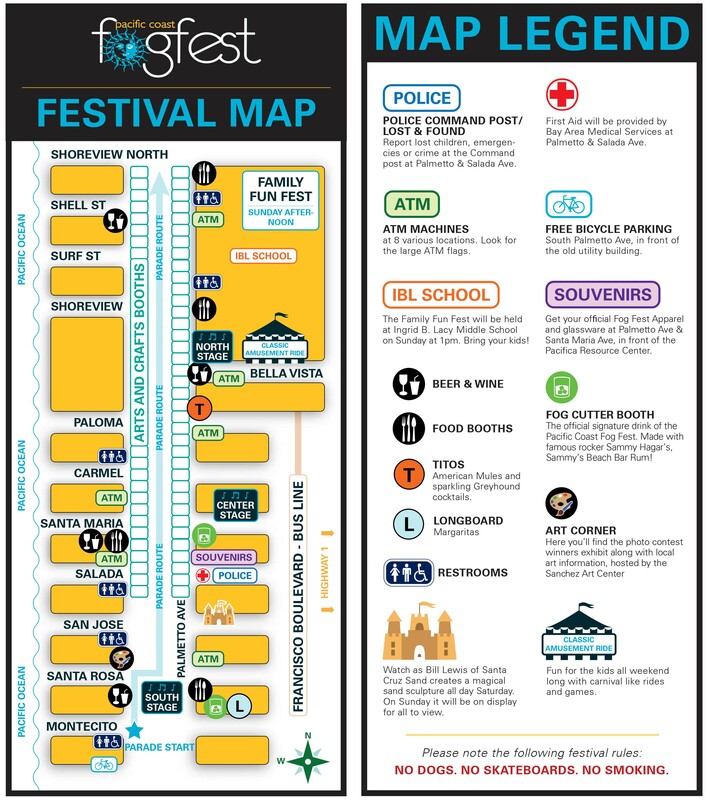 The festival grounds are located on Palmetto Ave. in Pacifica between Shell Street and Montecito Streets. Beginning at 4pm Friday, Palmetto Avenue will be closed to traffic from Shoreview Ave. to Montecito Ave. throughout festival weekend. Palmetto will re-open on Sunday at approximately 9pm. NOTE: Due to Palmetto Street improvements, a new access point for residents living on the west side of Palmetto Ave. will be available. By vehicle, residents will now enter the West Sharp Park area via Montecito Ave. and exit at Clarendon Ave. Montecito Ave. will be available to cross over Palmetto Ave, with strict direction by Pacifica Police during festival hours. Note: Beach Blvd. will be open to 2 way traffic festival weekend, (typically it is a one-way street). All west traveling streets off of Francisco Blvd. will be monitored & have limited access. These stations have relocated at the corner of Salada and Palmetto Avenues. Monitored and Handicap parking can be found on the south & north ends of Palmetto Ave., there will NOT be any parking available south end of Palmetto until after the Parade on Saturday morning, estimated time that parking will be available is 11 am, look for the parking attendants. Parking areas will be operated by local organizations and a voluntary $8 contribution is suggested. 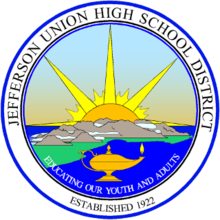 Thanks to the Jefferson Union High School District, additional parking can be found at Oceana High School, located at the corner of Oceana Blvd & Paloma Ave, directly across Highway 1 & the festival grounds, look for the signs. Parking here is $6 and includes Handicap parking upon entrance. Free street parking can be found on Oceana & Francisco Blvds. Please be aware of prohibited parking signs, police will be enforcing illegal parking. PET POLICY: Please, for your pets safety and others, be kind to your pets and leave them at home. NO skateboards, bicycles or smoking on the festival grounds. Security staff will be enforcing our policy, thank you. There will be approximately 8 to 10 ATMS located throughout the festival grounds for your convenience. Please look for the ATM Flags. The Fog Fest Command Post will be located in the south building of the Pacifica Resource Center. Look for Block Captains in bright orange safety vests for assistance. 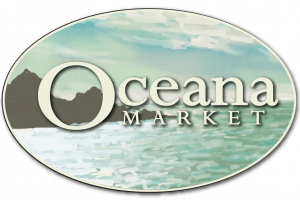 For Visitor Information visit the Pacifica Chamber of Commerce’s website where you’ll find links to hotels, restaurants, beaches, trails & more.